This time last week, we had just finished up a weekend long youth event called Love God, Serve. It was the first time that we had done this event. In the past, we have always done two weekend long events per year. The Stand which is a major focus of ours and then we had done something called servolution. When we were planning out the youth calendar for this year, we talked, prayed, and decided that it would be amazing to turn “serving others” into a year long focus…not just a theme for one or two events. My favorite thing about Love God, Serve was that it was not just our group. This was a group of youth pastor’s (including Otis) from our community that did the planning for this. The event included an opening rally with glow worship on friday night, service time during the day on saturday and a cookout with inflatables followed by a closing rally on saturday. Our group came back and stayed the night and ended the event after church service on Sunday. If I remember correctly, this event spanned seven youth groups and four denominations. That is an awesome thing!! Why do we spend so much time comparing and trying to outdo one another when we all have the same end goal anyway!?!? It was super exciting to me to see the room filled that saturday night and know that Charleston was blessed in so many ways on that Saturday afternoon. 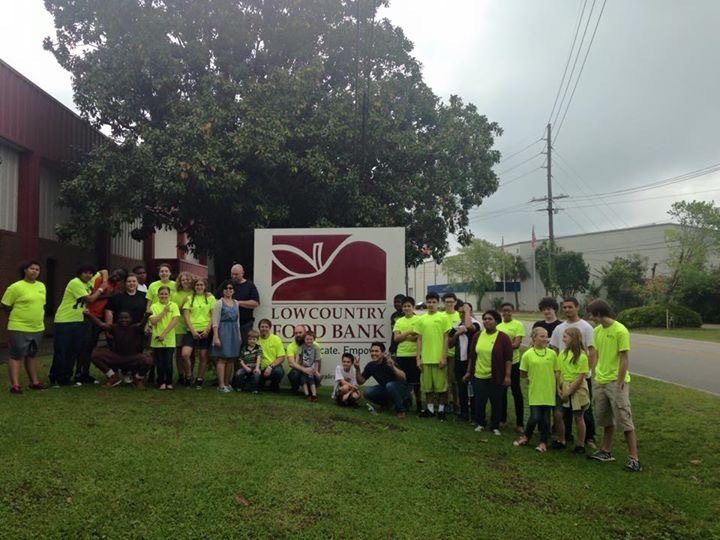 Our group went to The Lowcountry Food Bank. It was my first time there. What a massive operation!! The work that they had for us was certainly not glamorous. In fact, some of the things were straight up gross. I didn’t hear one of our teenagers complain. They worked hard amd got a 3 hour job done in half of the time. I walked around and took pictures a lot, so I was moving from table to table. We usually have an pretty great group that is willing to do whatever needs to be done. However, there is also usually one or two students that couldn’t care less that we have to watch and stay ont op of what they are doing. This time was different. Everyone was working. Everyone was doing. I am as always so proud of them. They are a great group of students! Some of the other groups were ministering to different people all over our community. There were groups doing yard work in neighborhoods. There was a group building a ramp for an elderly person. Numerous groups went to different nursing homes- to help out inside and outside. These are just the few examples that I can remember off the top of my head. Don’t you dare write off teenagers because they look/dress/act different than you. They are full of passion. They are an army…a force to be reckoned with. It is true that one single person can make an impact, but wow, when we work together…the ripple of that can be phenomenal!